It is a thirty year old tank. It makes good sense that the battle armor budget can be improved on. Yet after saying all that, what really is needed is to swap in an engine that uses the power system we have understood through the original work by Tesla. The machine becomes independent of fuel. the design was designed to allow swap ups of the electronics so that is no issue. The next full redesign will include such power and also gravity control plates that may even allow it to float along in the air as well. Shades of the Slammers of David Drake. General Dynamics Land Systems (GDLS) will start to deliver the first production M1A2 SEP v.3Abrams to the U.S. Army starting in 2017. Out of a total of nine prototypes built, the company has delivered seven prototype tanks for field-testing at the Yuma Proving Ground in Arizona and the Aberdeen Proving Ground in Maryland. The Army will start to field the new Abrams model starting in the third quarter of fiscal year 2020 after testing of several prototypes. The upgrade improves Abrams’ Size Weight and Power-Cooling (SWaP-C) capacity as the tank was running out of room to grow. The new Abrams variant also includes improved connectivity—allowing for better communications with advanced network capabilities. Tank crews are also afforded vastly improved displays and man-machine interfaces that should enhance their situational awareness. 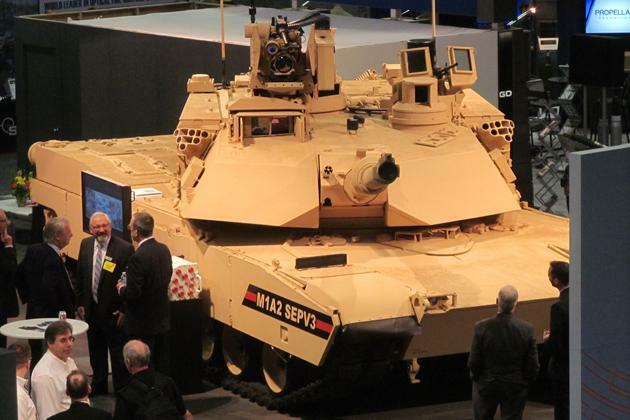 The SEP v.3 ​also has improved survivability and lethality compared to older Abrams models. Kotchman said that the vehicle has advanced abilities to defeat improvised explosive devices and has an upgraded armor package. The addition of a new Ammunition Data Link supports use of advanced new ammunition types that are either already fielded or will be fielded in the near future. New Vehicle Health Management System (VHMS) supports off vehicle reporting of maintenance status. New Line Replaceable Modules (LRMs) help to improve on-vehicle diagnostics and repair, which should greatly improve vehicle availability due to decreased downtime. New under-armor Auxiliary Power Unit (APU) helps to reduce fuel consumption and should lessen the wear and tear on the tank’s Honeywell AGT1500C 1500shp gas turbine engine. Donald Kotchman, General Dynamics Land Systems’ vice president for tracked combat vehicles, deferred comment about whether the Army needs to develop new tank to defeat the new Russian T-14 Armata as the Germans intend to. Berlin is clearly concerned by the Armata and is hoping to develop an entirely new main battle tank to counter it. However, Kotchman did say that the M1A2 SEP v.3 is just one of the upgrades in the pipeline for the Abrams. However, he deferred comment to the U.S. Army about the nature of those potential additions. “The Army is considering additional engineering changes that would add capability to the Abrams tank,” Kotchman said. Wikipedia describes the variants and upgrades of the Abrams. Here is the section that is M1A2 and M1A3 related. M1A2 (Baseline): Production began in 1986 and entered service in 1992 (77 built for the US and more than 600 M1s upgraded to M1A2, 315 for Saudi Arabia, 218 for Kuwait). The M1A2 offers the tank commander an independent thermal sight and ability to, in rapid sequence, shoot at two targets without the need to acquire each one sequentially, also 2nd generation depleted uranium armor components. M1A2 SEPv3: Has updated electronics and software, an Ammunition DataLink (ADL) to use airburst rounds, improved FLIR using long- and mid-wave infrared on 1080 screens, a low-profile CROWS RWS, and relocated Auxiliary Power Unit (APU) under armor to run electronics while stationary instead of the engine. Expected in 2017. M1A3: Under development, with development planned to start by 2020. Improvements are to include a lighter 120 mm gun, added road wheels with improved suspension, a more durable track, lighter armor, long-range precision armaments, and infrared camera and laser detectors. A new internal computer system is also desired, with current wiring replaced by fiber-optic lines that could decrease weight by some two tons. CATTB – Experimental model with a 140 mm smoothbore gun, heavy armored turret and upgraded hull based on the M1’s chassis. It had a mechanical loading system in turret bustle, a new engine and probably other upgrades, never fielded. The tank went into trials in 1987–1988. CATTB stands for Component Advanced Technology Test Bed.